The sounds of cicadas fill the air as the sun hangs low on the horizon. My little dog is inside; it's too hot for him to be out and about for longer than needed at this point. Patches are grass are browned from the heat and the humidity makes it hard to breathe. A Missouri August is unpleasant, to say the least, yet life still finds a way. August 1st is traditionally August Eve, though the technical event won't occur until the morning of August 7th. Still, I celebrated this holiday on the full moon in July so it seemed appropriate to go ahead with building my altar. August Eve, more commonly celebrated as Lammas or Lughnasadh, is the celebration of the first harvest. Typically, this is the time of shucking corn and cutting wheat, grains that are essential to our well-being. Because of this, we make wheat and corn dolls as typical parts of celebrating the holiday, utilizing every piece of the plant from which our food comes. We bake loaves of bread and serve it alongside corn on the cob. With this being the last summer holiday, we honor the light and long days for the last time. After this, we turn our attention to the coming equinox and the cool breeze of fall. For this altar, I challenged myself to use no unnatural or man-made items. The only items that I didn't find in my yard or on the walking trail were dried corn and wheat - these I already had in stock. Everything else was found the day that I created this August Eve altar. The center-most focus of this altar is the wheat stalks. Wheat has been cultivated by our species for nearly 10,000 years. It symbolizes life as it creates a food source, abundance as that food source is calorie dense, and cycles as we must grow and harvest it every year. Wheat is also among the harvests for August Eve, thus making it an appropriate addition to the altar. 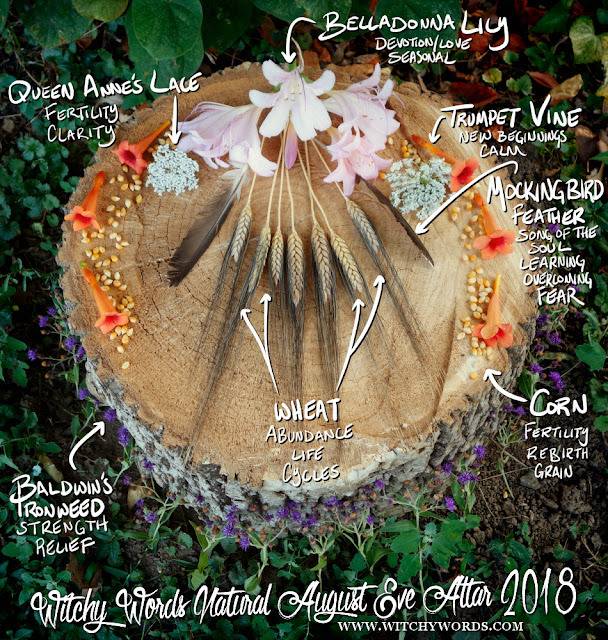 The wheat stalks on the altar burst forth from a slew of Belladonna Lilies, also known as "Naked Ladies." You may remember that I had small buds of these on my May Day altar earlier this year. While I talked about the Greek tale of the nymph Amaryllis and why this flower represents love and devotion in the spring, I think the blossoms here better represent the same cycles of life as the wheat. Those small spring blossom eventually wilt, giving way to the taller, fuller blossom seen above at the end of summer. This happens every year like clockwork, announcing the start and end of the summer season. Alongside the wheat and lilies, I placed two mockingbird feathers I found on the ground while sifting for additions to the altar. The mockingbird is a song bird who sings from the soul and is common to Missouri year-round. It is an animal that represents learning and overcoming fears, two important features of the cycle of life as we move forward. Through this portion of the altar, I show the cycles of the year both sprouting and encased by life lessons we must learn to overcome. Surrounding this display of life lessons through the cycles of seasons are Trumpet Flowers. Bringing bright orange blossoms right at the end of summer, the Trumpet Vine represents new beginnings. It's also sometimes called the "Morning Calm" as they bloom in the early morning. Adding the Trumpet Flowers to the altar states that this is a new cycle in life, a new beginning, and adds a certain calmness to what could otherwise be considered a disruption. A note of caution: Trumpet Vines are also known as Cow Itch Vines because they can cause redness and inflammation for some people who come into contact with them. I'm not even allergic to poison ivy, so I didn't have any issues here. Just something to bear in mind if you plan to use them for your own altars. Along with the Trumpet Flowers are dried kernels of corn. Corn is another product of the harvest for August Eve, yet again representing the cycles of life and the fertility of the land. However, in addition to this, corn also represents a rebirth of sorts. Along with the flowers, the corn represents this new phase, this new cycle, in life. It also connects to my August Eve/Full Moon ritual, which was heavily based in my own rebirth. Right where the Trumpet Flowers and corn sprout from the lily, I've placed Queen Anne's Lace. According to legend, Queen Anne, wife of King James I, wanted to create lace that held the same beauty as a flower. After pricking her finger while making the lace, a drop of blood landed right in the center. This is represented by the maroon flower at the center of the plant. Because of its connection to Queen Anne and blood, this plant is often said to represent fertility and beauty. However, it's also a flower of clarity and sanctuary. These secondary characteristics are the basis for my using them on the altar. From the lily, representing the cycles of life, new beginnings and rebirth come from clarity and sanctuary. If you're not sure where this altar is going yet, I'll bring it all together for you soon. Finally, Baldwin's Ironweed buds surround the entire base of the altar. Derived from its name, Ironweed often represents strength during tough times. Medicinally, it was used to relieve pain. These two traits assist the meaning of the altar, surrounding this new cycle and rebirth through life lessons and overcoming fear with strength and relief. Overall, this altar is about showing strength, finding relief and overcoming fear when facing a brand new cycle of life born of clarity and life lessons. It is symbolic of my leaving my coven and starting down my new journey with elements of Trad Craft and spirit work. This August Eve altar is my way of working through feelings of remorse, regret and frustration to find some relief and clarity during this time. Here's wishing everyone a blessed August Eve!